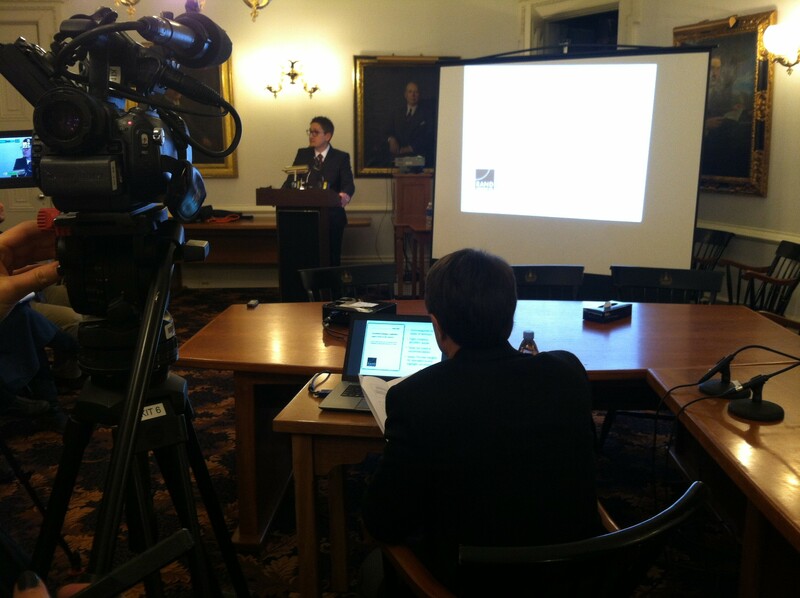 Beau Kilmer, project leader for RAND Corporation, presents a report Friday at the Statehouse on legalizing marijuana in Vermont. Legalizing marijuana in Vermont could bring in anywhere from $20 million to $75 million a year in tax revenue, according to a state-commissioned report released Friday. Should state government tap into that money by making pot legal? The report, written by the RAND Corporation, makes no attempt to offer recommendations but instead pulls together a heap of information lawmakers might use in answering that question. The estimated tax revenues represent a wide range because there are so many unknowns, the report's authors said. Beau Kilmer, RAND's project leader, presented it to roughly 50 legislators, administration officials, prosecutors and others interested in the issue. Supporters were anxiously awaiting the report, hoping it would help kick off a legalization debate this year in the legislature. Sen. David Zuckerman (P/D-Chittenden) plans to introduce legislation in the coming weeks to legalize marijuana in the state. Legislative leaders and Gov. Peter Shumlin have previously said they are waiting to learn more from states that have legalized marijuana before passing a law in Vermont. In a statement released Friday, Shumlin said the discussion "must be rooted in facts and transparent about the uncertainties," adding that the RAND report "will serve as a critical foundation" to the debate. RAND's study offers information on marijuana use in Vermont now, how that might change if the drug is legalized and how other states are handling the tricky task of legalizing a substance still considered illegal by the federal government. The 218-page report illustrates many complicated questions facing lawmakers, such as who would be permitted to sell it, where people could consume it and how it should be taxed (by quantity, strength or price?). Four states have legalized marijuana through public referenda: Colorado and Washington came first last year. Alaska and Oregon are planning to do the same. The RAND report looked at what those states have done, but also at marijuana consumption and laws in Vermont. Kilmer warned Friday that it's tough to accurately pin down information on an illegal drug. “Because it’s a black market, it’s very hard to have precise figures here,” he said. Some 60,000 to 100,000 Vermonters use marijuana, the study estimated, spending $125 million to $225 million on it every year. Far fewer marijuana users land in the emergency room than alcohol users. They are treated slightly less frequently than opiate users but more than cocaine users. Those who used marijuana within the last month spent an estimated average of $1,800 a year on the drug. After Vermont decriminalized an ounce or less of marijuana in 2013, the number of people charged with criminal marijuana offenses fell by 80 percent. However, the total number of those charged with a criminal or civil offense for marijuana increased by 20 percent. The number of criminal cases for possession of less than two ounces fell from 1,487 in 2013 to 164 in 2014. Vermont spends $1 million a year enforcing marijuana laws. While regulating marijuana could resemble regulating alcohol, there are differences, the report indicated. “Taxing marijuana is more complicated than taxing alcohol," the report says. "Over time, a for-profit marijuana industry is likely to gain strength, to push pretax prices down, and to evolve in unforeseeable ways, frustrating even the most carefully thought out tax laws." Due to its geography, Vermont would likely attract more visitors than the Centennial State. “Colorado did not have to worry too much about attracting large numbers of near neighbors; it is relatively isolated, at least from major U.S. cities," RAND wrote. "Vermont, on the other hand, has 40 times the number of its own marijuana users living within 200 miles of its borders. This fact should feature prominently in discussions about the future of marijuana policy in Vermont." The report also acknowledges health concerns about marijuana. “The harms of marijuana use are diffuse, debated and more serious for behavioral and mental than physical health,” it says. Will Highway Safety Put the Brakes on Legalizing Pot in Vermont?